A prototype of the new Russian Sarmat ICBM, which is meant to replace heavy silo-based Satan missiles, is ready for field trials in summer next year, TASS reported. The schedule was pushed back a few months after the location for trials was changed. The RS-28 Sarmat is the newest heavy liquid-propelled intercontinental ballistic missile currently being developed for the Russian military. It is to replace the old Soviet R-36M missiles, dubbed ‘Satan’ by NATO, as the heavy silo-based component of the Russian nuclear deterrence. It has been in development since 2009 and is scheduled to start replacing the old ICBM’s in 2018. According to a TASS defense source, a prototype of Sarmat that would be used for flight trials is pretty much ready. “The Krasnoyarsk machine plant has manufactured 100 percent of the missile. Some parts of it are being tested in-house now. The date of launch trials depends on when a silo at the Plesetsk range that is to be used for the trials is refurbished,” the source said. The source added that flight trials of the new missile may be expected in “July or August 2016” after a short period of launch trials. Sarmat will use the same silos that house Satan at the moment, but the two missiles have quite different specifications. The silos would be rebuilt for the new missiles and equipped with additional active anti-missile systems that would protect them from a pre-emptive strike. The silos would also be additionally fortified to better withstand close nuclear strikes. Initially the field trials of the missile were planned to take place at the Baikonur Cosmodrome in Kazakhstan, but the military decided the Plesetsk site instead. The change required additional work to prepare a new silo for the trials. There is little information about the highly-classified project. Sarmat is a two-stage missile with an estimated operational range of 10,000km and mass of at least 100 tons, including a payload heavier than 4 tons and up to 10 tons, according to some reports. It would have a MIRVed combination of a dozen heavy warheads, each individually steerable during reentry. 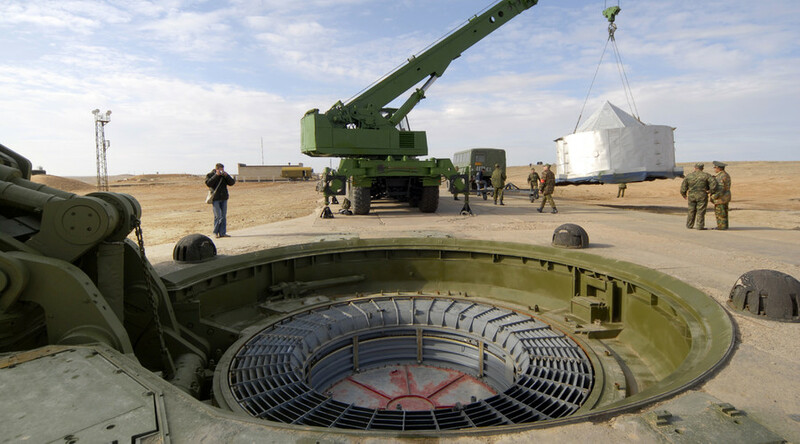 Sarmat warheads are to have advanced antimissile countermeasures meant to beat the US ABM shield. Some speculations say they would have a conventional hypersonic variant like the American Advanced Hypersonic Weapon or the Chinese WU-14 and could be used as a precision intercontinental weapon in a non-nuclear conflict. The Russian military plans to put Sarmat in service in late 2018 and complete replacing older variants of Satan by 2020.